October 15 - Application and recordings are due for pre-screened areas. November 1 - Application and recordings are due for non pre-screened areas. November 15-30 - Live auditions are held at SFCM by appointment. December 3 - Application, including an uploaded unofficial transcript, pre-screening recording, and final audition recordings are due. January 1 - Letters of recommendation are due. January through March - Please see below for audition dates for your area of interest. March 15 - Graduate admission decisions are released. April 1 - Undergraduate admission decisions are released. April 15 - Enrollment deposit for incoming graduate students is due. May 1 - Enrollment deposit for incoming undergraduate students is due. Non-refundable $110 application fee must be paid by credit card to submit application. Late applications are charged an additional $50. Current students and alumni of SFCM collegiate and pre-college divisions have a reduced application fee of $50. All applicants are required to submit two letters of recommendation. One must be from the applicant's current private music teacher or ensemble director. Recommendations will be submitted electronically. The applicant will provide the names and email addresses of two recommenders when completing the application. An email with detailed instructions for completing the recommendation will be sent to each individual as soon as the applicant enters this contact information in the application. Recommendations should be received no later than January 1. Undergraduate applicants: Please submit transcripts from all high schools attended. Undergraduate transfer applicants: Please submit all high school and college transcripts. Home-schooled applicants: Please submit either an official transcript issued by an accredited institution, or the diploma from the GED or CHSPE. In addition, home-schooled applicants should submit the SAT or ACT. Graduate and postgraduate applicants: Please submit all college transcripts. International students must also provide notarized course-by-course translations of their transcripts if the originals are not issued in English. The Office of Admission may require that international transcripts be evaluated by an organization specializing in foreign credential evaluation, such as World Education Services (wes.org) or Educational Credential Evaluators, Inc. (ece.org). Please upload copies of your unofficial transcripts to your online application before December 1. These should be uploaded in the "Academic History" section of the application, and may be a screenshot of an online portal or a PDF of a paper copy. If you are admitted and decide to attend, you will be responsible for submitting an original copy of your final official transcripts to the SFCM Office of Admission no later than July 1. Final official transcripts indicate a degree has been completed, contain an official seal or signature, and come directly from the institution via an online system or snail mail. Students completing their degrees after July 1 must contact the Registrar prior to the deadline. Applicants for the Master of Music degree program must upload a writing sample, such as an academic paper, from their undergraduate studies. All applicants must complete an audition. Auditions are held both in San Francisco and regionally. We encourage students to audition in San Francisco so that they may experience our vibrant campus firsthand. Local and regional auditions, along with final audition recordings, are not judged preferentially; students will receive equal consideration. Residents of California are required to attend a live audition. See your specific area of study for more information about audition requirements. Official SAT or ACT scores to support transcripts. The Conservatory's school code for SAT is 4744; the code for the ACT is 0403. We will accept scores as official if they are listed on the student's official school transcript. Students wishing to transfer to the Conservatory must show evidence of a satisfactory academic record at all institutions of higher education and secondary schools attended, and are required to submit official transcripts from all of them. Transfer applicants who wish to enter at a level corresponding to their previous experience should perform repertoire during their audition that mirrors the Conservatory's jury requirements per level. For example, a transfer applicant hoping to enter as a sophomore (2nd year) flute major should perform audition pieces that mirror the Conservatory's freshman (1st year) jury requirements for flute. 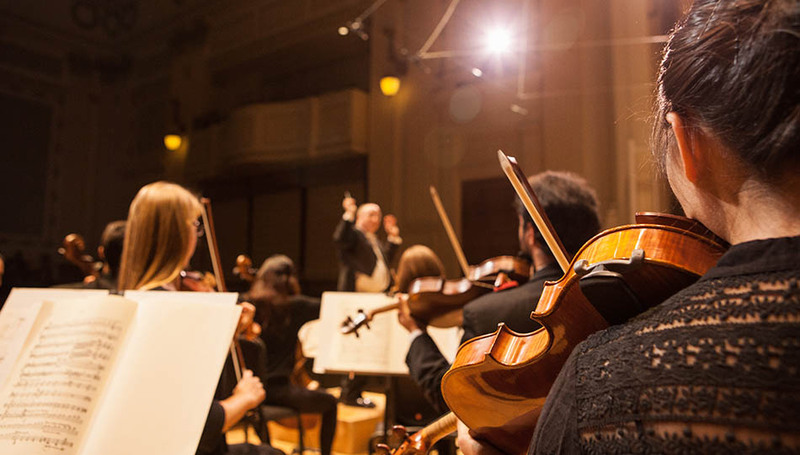 Applicants for the Master of Music degree and Artist Certificate programs are expected to hold a bachelor's degree in music from an accredited college, university, or conservatory. In exceptional cases, a student who has a degree in an area other than music and who has had excellent audition results and experience in music theory and history may be considered. Others may be recommended for admission as transfers into the undergraduate program. Graduate students may be able to transfer graduate credits to the Conservatory’s undergraduate program. The Conservatory will not accept any transfer credit at the graduate level. Drawn from around the globe, our students contribute to a rich mixture of ideas, talents, customs, and backgrounds in a collaborative environment. Within a total collegiate student body numbering around 400, students hail from 35 countries and 35 states, and speak more than 20 languages. Over 30 percent of our students are international. Students whose first language is not English must submit either a TOEFL, IELTS score, or a certificate from ELS Language Centers in order to meet the minimum English proficiency requirement for admission to the Conservatory. December 1 - Applicants must submit a score report or ELS certificate in English from within the past 24 months with the application. This does not need to be a passing score, but know that a score of less than 60 may not be competitive. For this deadline, photocopies or screenshots are acceptable. March 1 - An official score report or ELS certificate from within the past 12 months in English must be received by the Office of Admission. This cannot be a photocopy or screenshot. If this is not a passing score, admitted students will receive conditional admission until the May 1 deadline below is met. May 1 - A conditionally admitted student intending to enroll in the fall semester needs to have a passing score report in English submitted to the Office of Admission. If the conditionally admitted student does not have a passing score submitted by this deadline, they may petition for an extension that involves matriculation in an appropriate summer ELS Class, or equivalent collegiate level course as approved by the Office of Admission. If the petition is not approved, the conditionally admitted student may defer admission until their score is passing for up to one academic year. International students who have completed at least two years of full-time academic study at an English-speaking college or university at the time of application may request an exemption from this requirement by submitting a formal request to the Associate Dean for Academic Affairs by the application submission deadline for their chosen program. Please contact apply@sfcm.edu with any questions. Non-native English speakers who do not meet the English language proficiency requirement at the time admissions decisions are made, but who have met the deadlines listed above, may be offered conditional acceptance to their desired program. Those students accepted with this status are eligible for Conservatory scholarships and have until May 1 to fulfill the English proficiency requirements. Those who do not fulfill the requirement by May 1 will not be allowed to enroll at the Conservatory. In order to take academic classes while at the Conservatory, non-native English speakers must meet the English language proficiency requirements outlined above for courses that correspond with a given degree level. Professional Studies Diploma candidates who do not wish to register for academic coursework will be limited to taking the following courses: ENS 200-513, HMS 210/211, HMS 212/213, IND 500, IND 600, IND 650, PRF 202-342, PRF 352-362, PVL 600, and PVL 620. Students wishing to take any other courses must receive special permission from the course instructor. International applicants are eligible to receive scholarships, but may be considered for Conservatory scholarships only and are not eligible for any U.S. federal or state grants or loans. All materials are due by June 1. SFCM is an equal opportunity institution of higher education and employer and is firmly committed to nondiscrimination in its delivery of educational services and employment practices. In compliance with all applicable federal and state laws, Conservatory policy prohibits unlawful discrimination based on race, color, creed, gender, religion, marital status, registered domestic partner status, age, national origin or ancestry, physical or mental disability, medical condition (including cancer and genetic characteristics), sexual orientation, or any other consideration made unlawful by federal, state, or local laws. It also prohibits unlawful discrimination based on the perception that anyone has any of those characteristics, or is associated with a person who has or is perceived as having any of those characteristics. When necessary, SFCM will reasonably accommodate individuals with disabilities if the individual is otherwise qualified to meet the fundamental requirements and aspects of the educational program and/or safely perform all essential functions, without undue hardship to SFCM and/or without altering fundamental aspects of SFCM’s educational program.